Set the mood: Creepy Halloween decor, such as spider webs and Jack-O-Lanterns, can be placed around the house and yard to help get guests into the holiday spirit. Halloween-themed music, such as “Monster Mash” and movies, such as “Dracula” and “Frankenstein,” can help offset any down time, as can sharing scary stories. Play some ghoulish games: Bobbing for apples is a Halloween tradition, but you can also have Halloween-inspired bingo or a pin the tail on the donkey-type game, such as pin the nose on the skull. Or try a treasure hunt for a ghost ship’s loot by scattering clues around the house that lead to ghastly goodies. Need some non-food prizes? 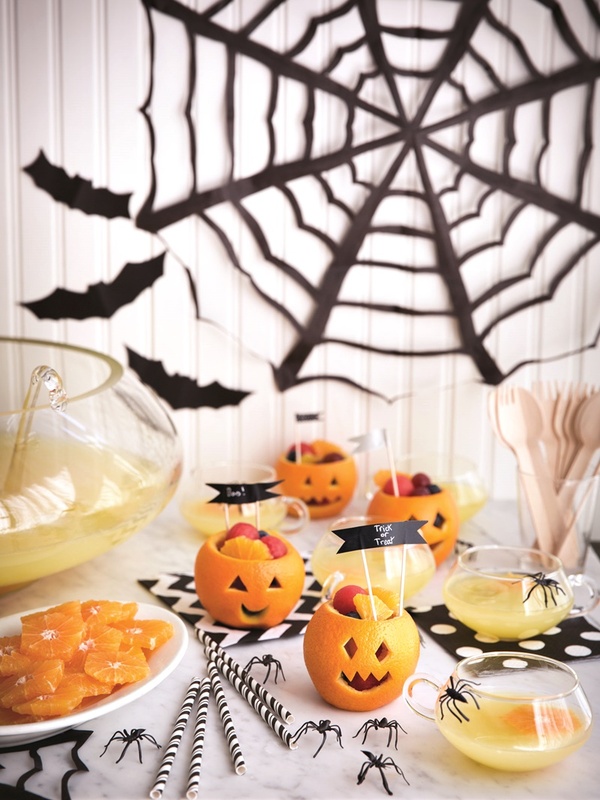 Check this list of Halloween Treat Ideas from FARE. Vampires, ghosts and zombies, oh my: Add a costume contest to the mix and hand out prizes to some of the best. Try breaking the contest into a few categories or by age, and awarding prizes, such as most creative, judge’s choice and crowd favorite. Peel mandarins, but leave the sections intact. Insert a small piece of celery in the center of each to make stems. To make 5 cups, freshly squeeze 3 1/2 cups of mandarin orange juice and 1/2 cup of lemon juice. Cover and chill. When ready to serve, pour the chilled juice into a punch bowl or pitcher and stir in 1 cup chilled sweet sparkling soda and ice cubes. Taste for sweetness, and adjust the flavor, if desired. Peel and slice mandarin oranges to make pinwheel shapes that resemble spider webs to garnish each drink. Use frozen red or black grapes as an additional optional garnish. Cut off the top 1/5 of an orange and use a paring knife to separate the fruit from inside of the orange, being careful not to cut through peel. It’s not necessary to get all of the flesh out, just enough to fill with cut fruit. Squeeze the juice from the removed fruit and add to the Bubbling Witches Brew. If necessary, shave a small amount of peel off the bottom so the cups sit level, being careful not to create an opening in the base. 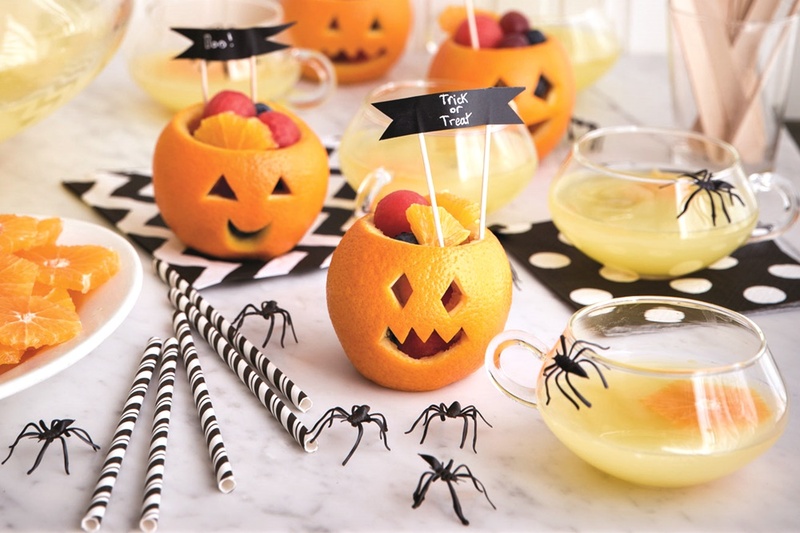 Use a paring knife to carve faces, and fill each cup with orange pieces, melon balls, grapes and blueberries. What are your favorite dairy-free Halloween fun ideas and recipes? Feel free to share links! Pingback: The Spooky Edition – Hey, you're not alone. All so cute! I miss the days when I had a reason to make such fun treats. 😉 Shared! These are great party ideas, Alisa. 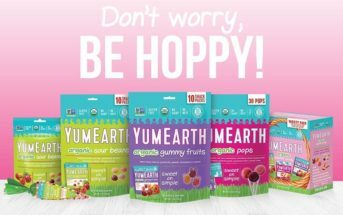 There is always way too much sugar and candy for Halloween, these are great alternatives – healthy, delicious and so cute! Love these healthy Halloween treats – they would appeal to all (kids and adults alike, those with allergies and those allergy-free.) The games and decorations are a bit “above my pay grade”, but wonderful none-the-less. i always appreciate your tips! sharing, pinning! Your table spread is just SO cute! I love that you have offered healthy options for a holiday that is just TOO full of sugar. you know my favorite – the Pepper Jacks I make every year! 😉 I love these Orange Pumpkins too, so fun! Yes, those pepper jacks are SO cute! These treats look awesome! They’d be even more awesome if I actually went to any parties, which I don’t, cause humans upset me 😀 BUT nonetheless that leaves MORE FOR ME and I would DEVOUR everything! Excellent ideas!